Our new school year has started! I had no clue that the timing of it would be so perfect as we wait to see close up images of Pluto for the first time. The kiddos are super excited about it. We've been watching the news almost every night, watching as the camera gets closer and closer. It's all such an exciting adventure. As always, I never feel ready for the fresh start of the new school year. I had hoped that our new learning time room would be 100% complete and organized. Just yesterday the last outlet cover was replaced. There are still two items that need to be hung on the walls, and a few other things I haven't even purchased yet. Jason and I had discussed how we wanted our learning routines to go this year. The ideas were wonderful and definitely inspired. Have we been able to implement any of them yet? Of course not. I was getting a bit frustrated with my lack of readiness, but on the first day of our new year when I began to talk about some changes we were going to make, Dinomite and Bulldozer completely melted down. Princess appeared okay, but I knew that when the changes were in full force, she would show me her true feelings about it. It took everything I had to help the kiddos through learning time. That's when I realized, had I finished everything I planned on introducing that first day, and been as organized as I had desired, the day would have been a complete failure. Slow and steady wins the race with my special needs kiddos as always. So, we're introducing one new change at a time. We're all breathing better now. What is the pink series? 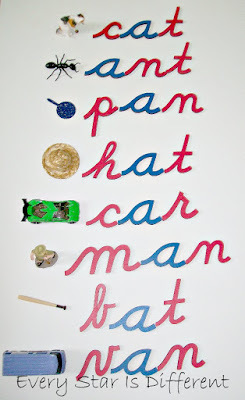 It is the Montessori way of introducing beginning phonics, using short vowel sounds and CVC (consonant-vowel-consonant) words. The pink series has a specific sequence, as you prepare your little one to read, write, and spell. Once a child completes the sequence of pink series learning activities, he moves on to the blue series, and finally the green series. I came across a wonderful post: The Montessori Pink Series from Our Montessori Home that explained the pink series in detail with pictures, I thought I'd share for those who want to understand it more. By the end of last year, all three kiddos were proficient at matching objects and pictures with first letter sounds. Dinomite has progressed much farther than that, but we've never officially worked through the pink series material. Princess and Bulldozer are finally ready and interested in it, so it's the perfect time to present it to them. I've decided to take things extremely slow as Bulldozer and Princess (at times) mix up their short vowel sounds. I'll be focusing on one short vowel sound per unit study, and then progress to all of them once each individual vowel has been covered. I've created a variety of activities on the shelves each week to accommodate all the different learning styles and levels the kiddos are at. Enjoy! The object of the activity is to use the movable alphabet to spell the names of the tangible items on the tray. So simple, yet the effects are so amazing. This is not a traditional pink series activity to my knowledge, but a variation of one. 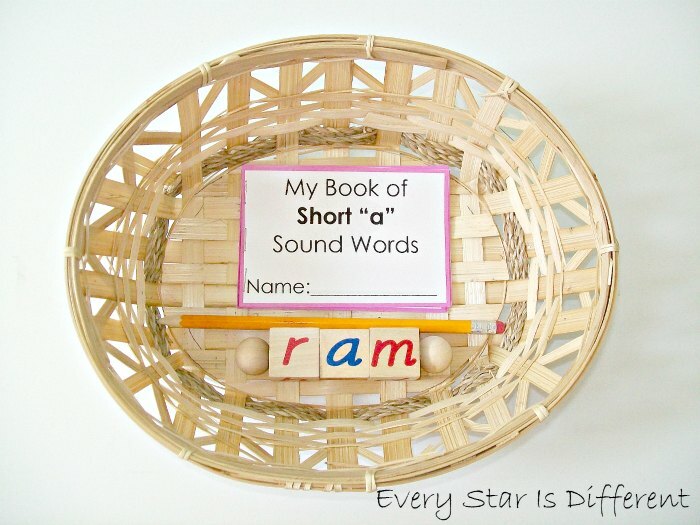 Our tray includes our Montessori Phonetic Reading Blocks for the Beginning Reader . Inside the book there is a a picture on each page. Below is a line for the kiddos to write the name of the object in the picture. If the kiddos are unsure of the proper spelling of a word, they can use the blocks to create the word they need. Source: I created the printable for this activity as part of my Montessori Pink Series Printable Pack 1. For your free copy, click on the link at the bottom of this post. 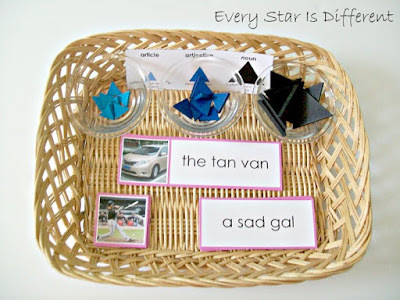 The kiddos will match pictures to word cards in this activity. The word cards are in cursive with print on the back to help the kiddos along with their cursive word identification. I love it when we can make progress in two aspects of studies with one activity! 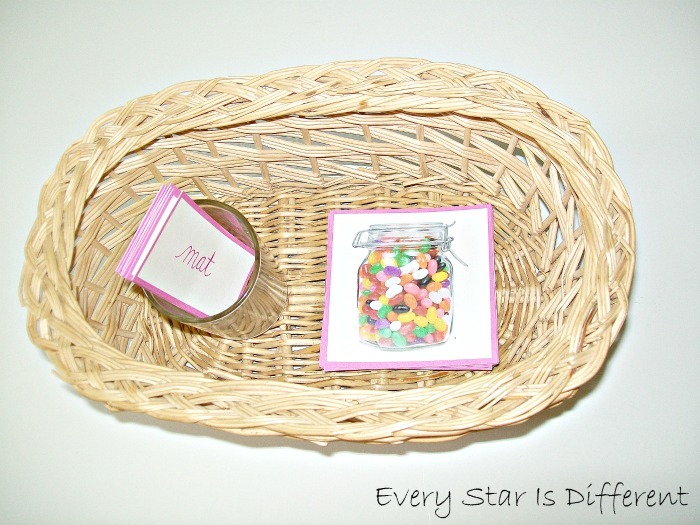 Source: I created the printable for this activity as part of my Montessori Pink Series Printable Pack 1. For your free copy, click on the link at the bottom of this post. The printable does not include words to match pictures, but instead blank cards with pink borders. I wrote in words using a pink marker in cursive and print. Bulldozer is my last of the three older kiddos to learn how to read. He's working so hard, but the process is very difficult for him. We've made it through almost all of the Level 3 BOB Book series. He practices reading each book until he's proficient and then we move on to the next. After reading the same word in several books, again and again, he usually can apply it to other situations like workbooks or activities on our shelves. However, he struggles sounding out words because of the vowel sound confusion (and a few other things). I wanted him to feel successful when reading when working with this activity. Thankfully, the activity is a success! The phrases for this activity were specifically chosen to help him work on mastering one vowel sound at at time. For this week, all the words on the cards have the short "a" sound. I've paired the phrases with pictures to help him if needed. After the first day, the control match ups were removed from the tray, as he didn't need them anymore. When I noticed what type of phrases were used in the pink series sequence, I realized that this activity would also be the perfect way to review the noun family: article, adjective, noun. I included a control card for the grammar symbols in case the kiddos have forgotten which ones are which. I always find it so amusing that Bulldozer knows all of his grammar symbols and definitions but he can't read or spell. The kiddos are using grammar symbols from our new Kid Advance Montessori Basic Wooden Grammar Symbols with Box . Princess has done this activity every single day. She has always loved dissecting phrases and sentences. Last month we gave our learning time room a make over. It was a huge undertaking and took much longer than anticipated. As mentioned earlier, we're still not finished with hanging things on the walls etc. In August the theme for the 12 Months of Montessori Series is Montessori Spaces. It's then you'll get a complete tour of our new room. (It's been so hard not to share sooner!) For now, I'd like to give you a small preview. This is our new reading corner! The library books on the shelves will be switched out for every unit. If the kiddos would like to read during our learning time, this is where they go. I'm trying to make sure I'm selecting a variety of literary works, both fiction and non-fiction for each unit. 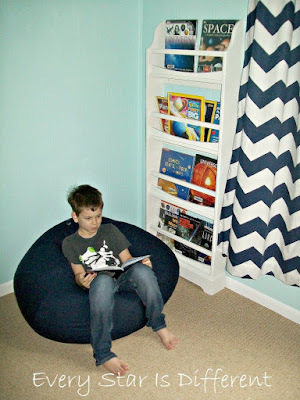 Even when it's not learning time, there's usually someone in the bean bag reading. 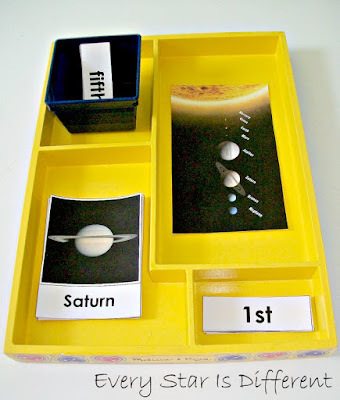 The kiddos will use the picture of the planets in order from the sun as a control, when they put individual planet cards in the correct order, and then label them with the correct ordinal numbers. 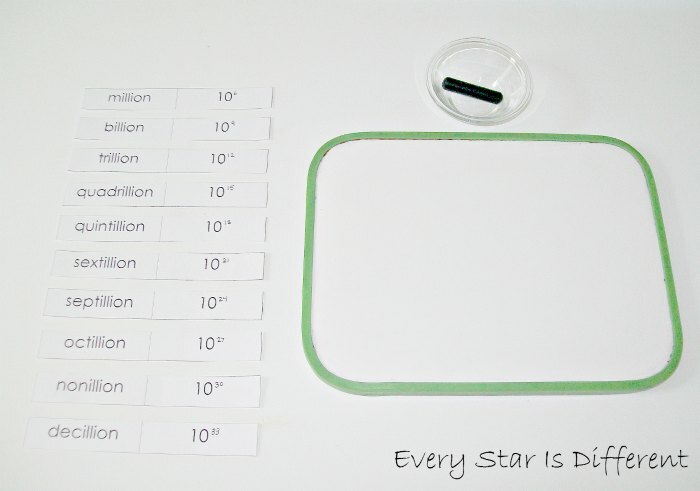 Source: I created the printable for this activity as part of my Milky Way & Solar System Printable Pack 1. For your free copy, click on the link at the bottom of this post. 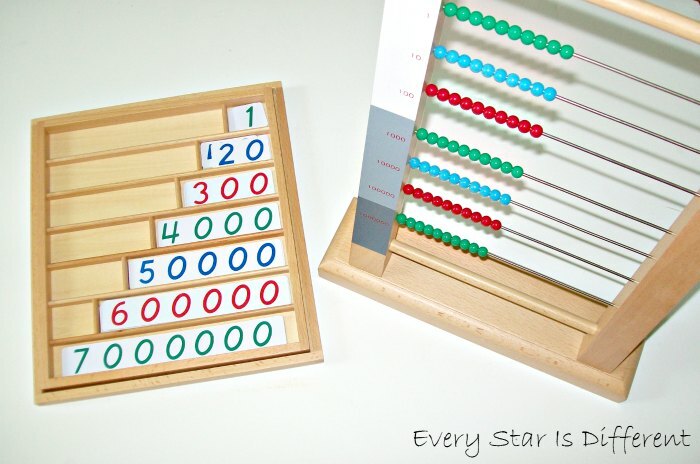 The kiddos will use the golden bead bar material and wooden number cards to create and show numbers 1-9,999. When I purchased the materials for this activity, I purchased them as part of the Brilliant Minds Montessori Math Kit . 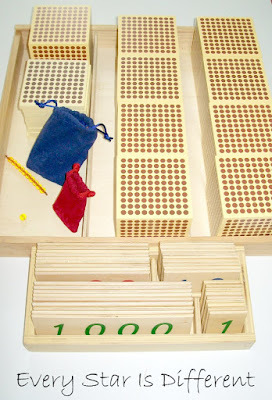 If you'd like a better understanding of how these Montessori Materials can be used, youtube is a great resource. The kiddos were introduced to the Montessori Large Bead Frame a few months ago. 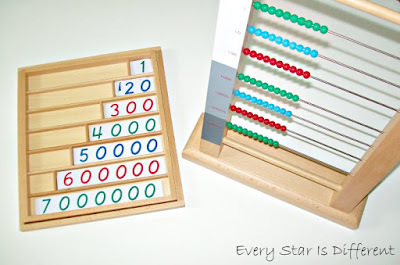 I love it because it provides a way for the them to understand large numbers in a very visual and tactile way without taking up too much space. You can better understand it's purpose as you watch this video on Youtube. 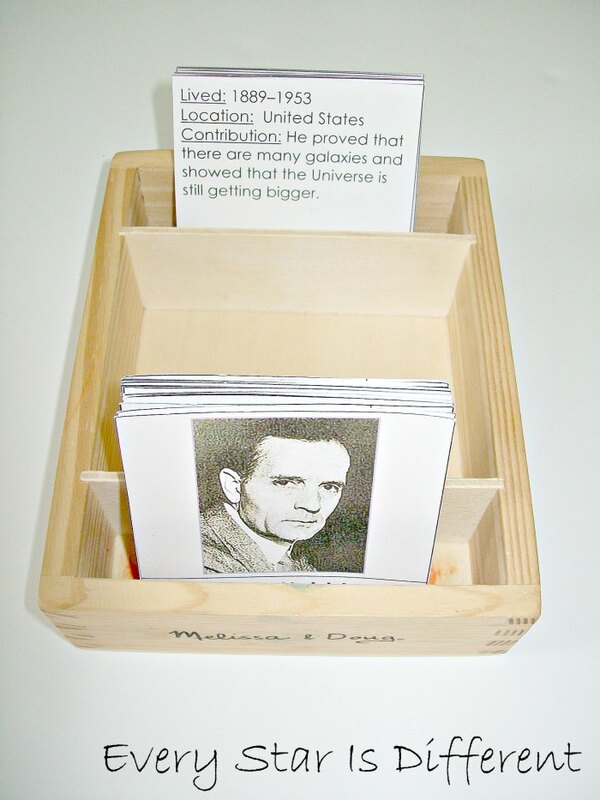 To carry over what the kiddos learned in the previous activity, I added cards from our Montessori Bank Game . The kiddos can create and visualize each number. As they create numbers, they present them verbally to me so I know they understand how to pronounce them. They're getting better and better at this. If you haven't noticed my kiddos are a bit obsessed with numbers right now. I've decided to just go with it, especially as it relates directly to our study of the universe. If' there's one subject that includes numbers to infinity, it's this one. Though we are only studying numbers to decillion, it's still plenty for them to try to wrap their heads around. This week's activity is also a great way to introduce the concept of the power of numbers in a way that's not too overwhelming. When choosing this activity the kiddos will put the numbers in the correct order and then select a few (according to their age) to attempt to write out on the white board provided. This has been very entertaining to watch. Ten to the 33rd power is a LOT of zeros. Lol. Source: I created the printable for this activity as part of my Milky Way & Solar System Printable Pack 1. For your free copy, click on the link at the bottom of this post. The cards do not have the power of 10s written in. I could not figure out how to do that. To write in the numbers, start with 10 to the power of 6 for million, and then count by threes from there. It could easily be debated that this is a language activity, however, since it provides a way to learn about each of the planets, I have it on our science shelves. There are two sets of cards. One set includes pictures of each of the planets. 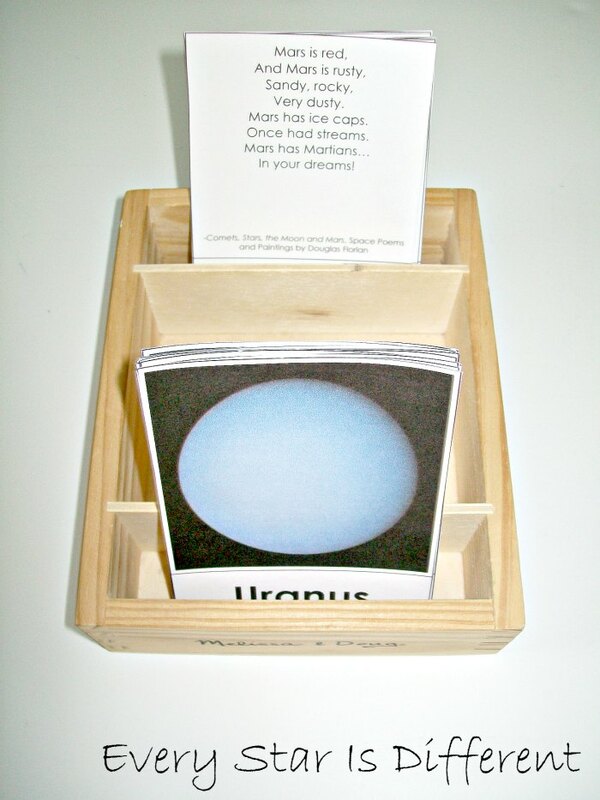 The second set of cards includes poems about each planet. It's the kiddos' job to match up the correct poem to the corresponding picture. Poems come from the book: Comets, Stars, the Moon, and Mars: Space Poems and Paintings . All of the kiddos have thoroughly enjoyed the poems. I'm in love with the book! Each kiddo has also chosen one of the planet poems to memorize and share. This will be their first time memorizing poetry. I'm super psyched! 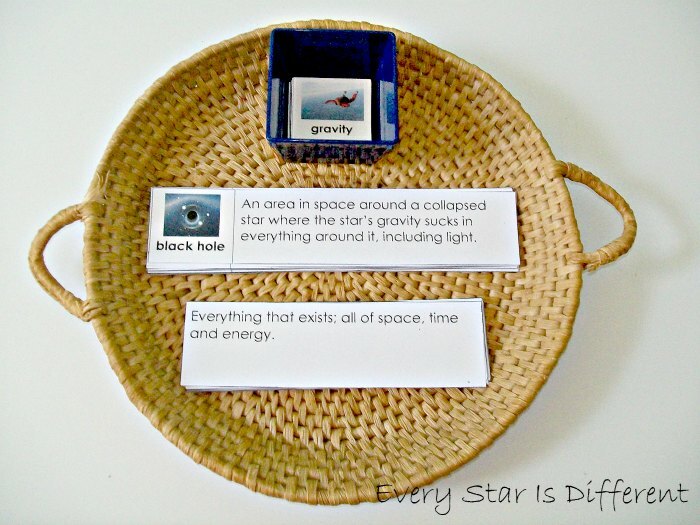 Source: I created the printable for this activity as part of my Milky Way & Solar System Printable Pack. For your free copy, click on the link at the bottom of this post. 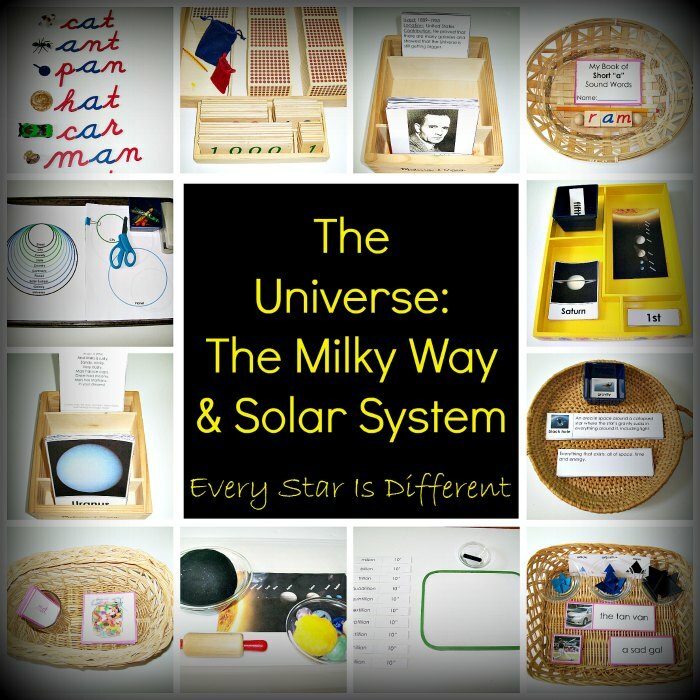 As part of the early elementary Montessori curriculum, children are introduced to the concept of the universe. This is a BIG concept to tackle. 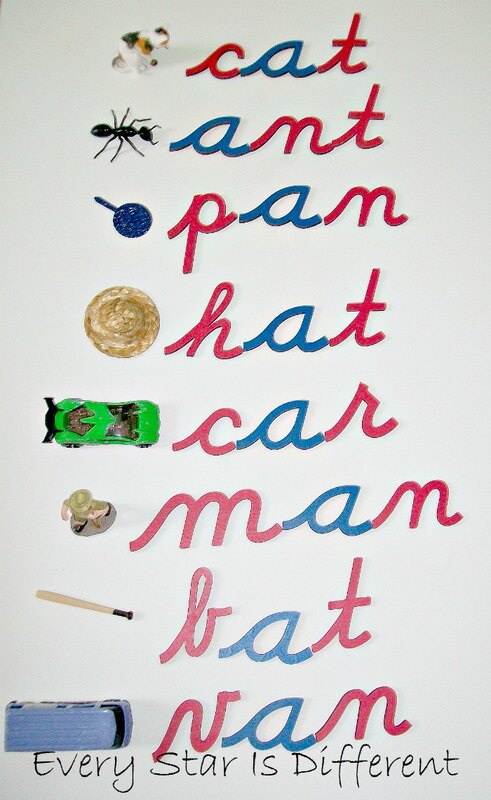 To help the kiddos understand new terminology they're hearing and reading, these vocabulary cards were introduced. So far they seem to be helping. Source: Jason created the printable for this activity as part of my Milky Way & Solar System Printable Pack 1. For your free copy, click on the link at the bottom of this post. The kiddos will use play dough to create space. 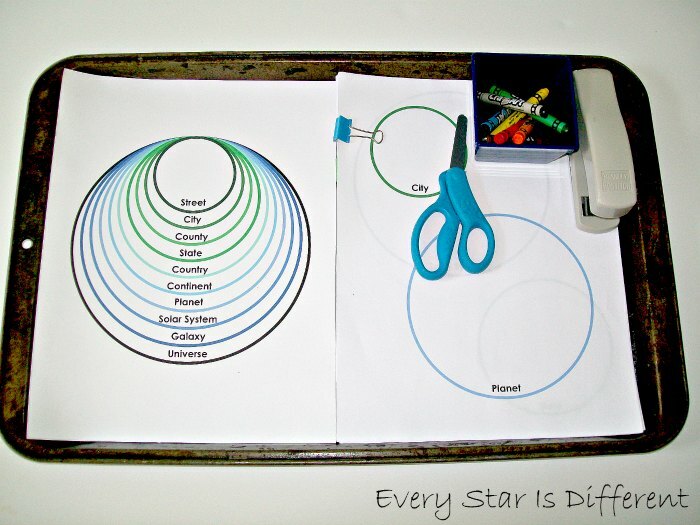 A pencil is provided (not visible in the picture) for the kiddos to draw elliptical lines in space representing the movement of the planets in the solar system. The large yellow pom pom is the sun, which will be placed in the middle. The marbles are reprsentations of each of the planets. They will be placed on the correct elliptical lines circling the sun. The marbles are from Bulldozer's vast marble collection. He was given Our Local Universe Marble Box Set a few years back. We supplemented other marbles for planets that weren't included in the set. We've done an activity similar to this in the past, but it was not as detailed in location. Originally I wanted to use stacked boxes to represent each place, but I kept running into adhesive issues, and didn't want to cause Bulldozer to go into anaphylactic shock. So, I decided to create my own printable. The kiddos will cut out each circle and draw a picture representing each place. Once all circles have been cut out and colored, they'll staple them together. I've provided a control in case they need help with the order. 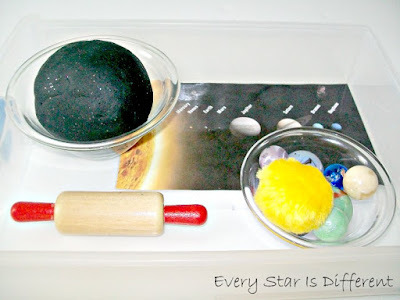 Source: I created the printable for this activity as part of my Milky Way & Solar System Printable Pack 1. For you free copy, click on the link located at the bottom of this post. Jason and I wanted to provide a little history lesson for the kiddos in the way of introducing philosophers, scientists, astronomers, etc. It was so much fun and helped them understand that the study of the universe is always evolving. Again, our timing couldn't have been more perfect with new pictures of Pluto coming this week. This event really brought the idea behind this activity to life. 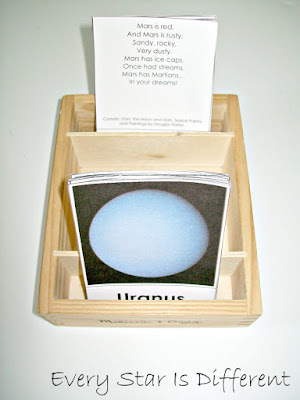 Source: Jason created the cards for this activity as part of my Milky Way & Solar System Printable Pack 1. For your free copy, click on the link at the bottom of this post. 4) Religious Activities-includes religious themed activities on our shelves, activities I create for home use, and activities I create for church. Stay tuned for the remainder of this unit's activity posts, as well as Sunshine's newest set of tot activities! Here's to the start of our new school year! Thank you for this amazing post! It is so helpful to me with the pink series and math info.